If your toddler will only eat macaroni & cheese, raisins, and occasionally ketchup, you’re not alone. Your toddler is perfectly normal. Every child goes through this stage — and for some, it lasts for years. But unfortunately, that doesn’t make it any healthier. And like every mom of a toddler, you’re probably desperate to persuade your child to eat something that isn’t a carbohydrate. And occasionally something that’s green. And sometimes, the only way to do that is to sneak it in. After a few years of dealing with a baby-who-loves-broccoli-turned-picky-eater, I’ve discovered many ways to motivate a kid to try new foods. 1. Smoothies. Okay, so I said this last time I made a list, but seriously? It deserves to be listed twice. It’s by far the easiest way to get toddlers to eat fruits and vegetables. You can put anything in a smoothie, and most toddlers will eat it. Add a little chocolate, and every toddler will eat it. And if you think kale doesn’t go with chocolate, you are obviously not a toddler. 2. Serve it off a different plate. Preferably your plate, because vegetables that are disgusting when served on a toddler plate magically transform into something delicious when eaten off your plate, especially if eaten while sitting in your lap and using your fork. Go figure. Failing that, try your favorite fancy china. Just supervise carefully. 3. Use smaller portions. It’s hard to appreciate how little a toddler really needs to eat (especially when your baby eats more than your big kid does). But they’re not growing as fast as they were when they were younger, and they’re still really small people. They don’t need a lot. Big portions can feel overwhelming to a toddler — and they can make you think your child ate even less than he really did since his plate is still full. Serve a tiny portion, and you’ll both feel less overwhelmed. 4. Eat fresh from the garden. My daughter will eat stuff straight from our garden that she would never eat otherwise. Like tomatoes. She won’t touch them from the store, but from the garden? She’ll gobble them up. She also eats lots of stevia from the garden, which is technically a leafy green if you eat it fresh, right? Work with me here. 5. Try dried fruits and vegetables. And freeze-dried. They are easily portable and they taste like candy. 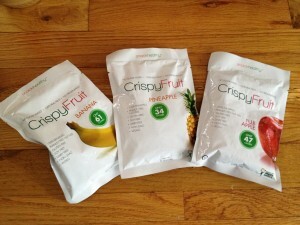 They’re Snack Healthy’s Crispy Fruit snacks, and I got some to eat and some to give away. My kids loved them — they’re delicious. The best thing about freeze-dried fruits is that they melt quickly in your mouth, so they’re safe for babies. But my preschooler ate most of them, which is just as well since she’s the picky eater. Like I said, they taste like candy. But they’re actually 100% pure fruit, with nothing added at all. I loved them too. The only issue I have with them is that the packs aren’t resealable — once they’re open, you have to eat them all. Which, on second thought, is actually a good thing, because why would you save them for later when they’re so delicious? Want to win? Just comment on this post! The winner will get three fruit packs: one banana, one pineapple, and one apple. Or, if you can’t wait, go to the Snack Healthy website to buy some now. Great article, Lisa! Miles is becoming quite picky now. I need to get on my game and make some smoothies! Brilliant post! One additional idea that worked for me was “hiding” things in meatloaf. IF your toddler will eat meatloaf, of course. You can hide a lot of goodness in meatloaf and call it “seasoning.” Parsley and/or basil are a great green vegetables packed with green and vegetable stuff, eggs (my kids would not eat eggs), raisons (for fun), celery (teeny tiny bits so they don’t notice the roughage), and whatever your little one is missing in the rest of his/her diet. Start small and gradually add more of the necessary ingredients so they don’t notice. Hee hee! Moms can be sneaky, too! I always comment when there is a chance of free food. I am pretty much the opposite of a toddler (and of Mikey–I eat everything). But I love dried fruit, too! HaHa, I’ve never grown stevia in our garden, but I can certainly see a kid wanting to snack on it. My daughter might eat the whole plant. I can vouch for kids eating anything out of the garden. Raw okra, whole bell peppers, tomatoes, lemon balm, you name it, they love it! ohhh these sound tasty! Thanks for the giveaway!